Should we all be drinking trendy alkaline water? The claim is that alkaline water, with a higher pH and altered chemical structure, is easier to absorb, which facilitates hydration. Not so fast… Health professor Dr. Dan Heil from Montana State University says there’s no solid scientific data to support those claims. Because our body neutralizes pH on its own, nothing we drink can affect our pH. However, alkaline water is a little sweeter than standard water. So if that helps increase your water intake, it certainly couldn’t hurt to sip it. How do I know? Because if your child is between age 6 and 19, there’s a 50/50 chance he or she is dehydrated. That’s according to a study conducted by Harvard scientists, who analyzed 4,000 kids. And they found that nearly 55% of them were “inadequately” hydrated, with boys being more at risk than girls. Erica Kenney led the study for the Harvard School of Public Health – and she says, this doesn’t mean that kids are dropping like flies or need to go to the hospital. But even slight dehydration can negatively affect a child’s mood, energy level, and ability to learn – and can lead to headaches and irritability. And kids are more prone to dehydration than adults. That’s because their thirst mechanism isn’t fully developed, so they often don’t feel thirsty until they’re in the early stages of dehydration. What’s better than watermelon on a hot day? Not only is it sweet and delicious – one slice of watermelon has the hydration equivalent of 10 ounces of water, that’s over a glass! And a slice of watermelon only has 85 calories! It’s the lowest carb fruit you can eat! How can you tell if a watermelon is ripe? Roll it around and check for the ‘couche’ — that’s the spot the melon rested on the ground while growing. If it’s white or yellow, it’s ripe. There should also be very little contrast between the stripes. Also, you want to store watermelons at room temperature to bring out the most nutrients. 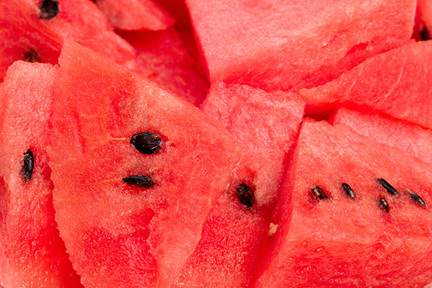 One cup of watermelon has more lycopene and beta-carotene than a medium-sized tomato. Lastly, ALWAYS WASH the rind before slicing. It can be harboring bacteria which gets transferred into the fruit when you cut it. Here are a couple good reasons to eat watermelon. It’s Labor Day weekend, and that means getting together with family and friends. 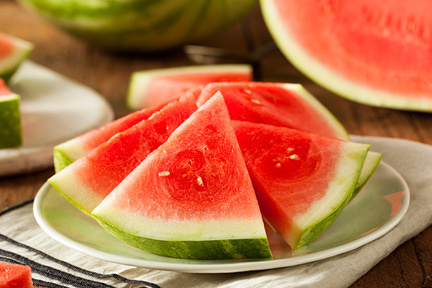 One of my favorite foods to serve at a cookout or picnic is watermelon. And since one slice of watermelon has nearly 10 ounces of water, it’ll hydrate you as much as drinking a bottle of water. It also contains a tissue-healing antioxidant that acts like sunscreen. And eating two cups a day can cut your risk of sunburn by 26% – and cut your recovery time in half if you do get burned.